I promised the raw cut--and I deliver. As you can see, I stuff all the extra serving pieces and odd sherbet glasses in the depths of the armoire. Platters, gravy boats, you name it--it's in there. What you won't see--plastic versions of the real stuff. I don't have room to store casual AND fancy, so I use a mix of better things every day. Some of it's better than others, naturally, but none of it's too valuable to be used. Tracy desperately wants to create a home for her crockpot. 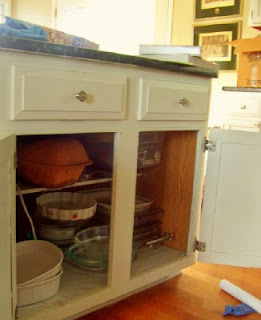 Mine lives in this lower cabinet, along with all the other casseroles, Romertopf clay bakers and big glass bowls. Don't faint just yet. I send a lot of yard sale Pyrex out with the intention that they never return. You'll remember that I store my blue-and-white dishes in one kitchen cabinet, glasses and coffee station in another cabinet, with gadgets and baking supplies down below. It's lovely seeing pictures from your home. I tend to have my baking supplies in the one spot too. It's good to see your baking dishes. I imagine they've seen a lot of family and community events. 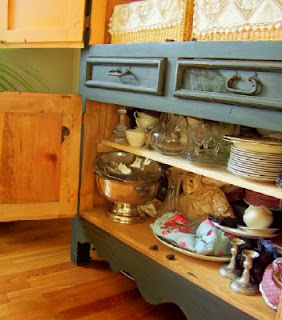 Sometimes no matter how much you pare down, the cabinets still get a little crowded:) I love seeing pictures, Meredith! I'm so glad you also use your nice (or at least, niceish) pieces of crockery often. I found that if I saved something "for a rainy day" I never really had the opportunity to enjoy it. I love your blog. A lady after my own heart--frugal and organized. I read your recent blog on frugal ideas for storage, loved them. I noticed what appeared to be a clay flower pot tray under your kitchen sink. I have a huge turntable that works great. I've had that turntable for years, I don't even know if they are still sold. Also, vinyl wall paper makes GREAT shelf and draw lining paper. It's tough and I only buy it when it's on sale at places like Home Depot or Lowe's. I can usually get a roll for $1.00. I'm not sure how long I've been following your blog, but maybe after this post? I want to squeal with excitement over your armoire. It, and all the stuff inside, is beautiful.